This is for new forum members that are confused/interested on the many aspects of the forum. Do this if your post time is not the same as your local time. Is someone constantly harassing you? Block them here! Have a friend or someone you want to keep track of? Add them here! You gain "points" by doing a vast majority of things: Posting, Voting, Polling, Uploading images, and Referrals. A green check mark indicates you have passed that milestone and can continue onwards! Here you will find information and links for certain aspects of the forum. Check out your experience, as well as miscellaneous information such as "Most Achieved Achievement" or "Most Active User"
View leader-boards for experience, reputation, and points for all other sorts of categorys. You can also sort by each of them. 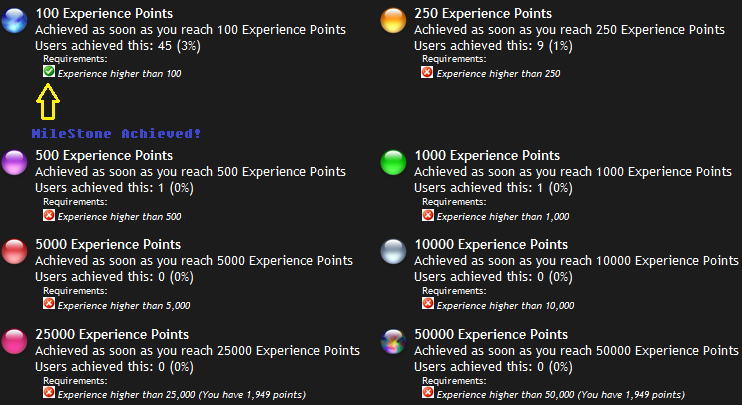 View a 10 min-delayed feed of all the points/achievements being gained by users of the forum! Here you can learn what things you can gain points for, and the ratio for doing said actions. This is basically a "Top 3" list for different categorys of misc. things that can be done on the forum. Check here for the latest upcoming Smite & Forum events. *Calendar has not been publicly launched. hay so i figured there's a lot of stuff about the forums that people don't know so i might as well write a post about it, mhmk? so pretty much everyone knows the core features (posting, private messaging, all that jazz) that's global on every single forum but it seems to me that rarely anyone knows how to use the other features. This thread is subject to change as there's so much to tackle that this is just taking a big chunk of what's different in this new software. So this is a traditional forum software with normal threading systems and posts are organized by date and not by user feedback or the like. Click here or here for more information. You get points for basically everything, from viewing posts to rating threads. You can edit your options such as Thread Subscriptions in the link above. Not much to say other than you can click it and the forums explain the options for you. You can edit your avatar, signature and all other options in your User Profile Settings. If you have no avatar, your avatar will be Cupid by default. If you have no signature, then a signature won't appear underneath your posts (and you can make your signature not show in posts in addition). In the top right-hand corner of the thread you can rate the thread on a scale of one to five stars. If you need your rating fix, here it is. You can press this button to queue multiple posts for queueing so you don't have to post multiple posts and flood the thread with your mindless blabble. Once you're done queueing posts up, just click the reply button. It's available on the bottom lefthand corner of every post (excluding yours). You can reward people anonymously for making good posts and punish bads for shitposting, depending on your Rep Power. You can see a user's reputation power in their postbit (underneath their forum avatar). You can only award certain individuals so much rep in a certain amount of time to avoid reputation abuse, so keep using the system to get more experience and to refresh the limitations of who you can give rep. If you have x rep power and give someone rep, then you will give them +x points and the same applies for taking points away. If you have 0 rep power, you can't take away rep. If you were given/deducted rep, you can see the 5 most recent usages of it by people who have used it on your posts and you. If you have a green icon in your report, it means you were given positive reputation. If you have a grey icon in your report, it means you were given positive reputation by those with less than one rep power. This does not increase your reputation. If you have a red icon in your report, it means you were given negative reputation. U dun goofed. At the bottom lefthand corner of each post (including yours), you've got this handy little icon: . This sends you to report.php, which allows you to send reports to the moderators and administrators. They get it in their control panel, so it may take a while for them to respond. Tagging is a free and easy way to earn reputation. It also makes it easier for the forum backend to find posts. It's located underneath the threads, near the quick reply box. If I missed anything or if there's something I haven't explained properly, let me know in the posts below. Last edited by KingScuba; 10-02-2017 at 09:12 PM. Much useful, wish this was here before I started finding this out myself. I like the formatting, it looks clean. Quality post to help beginners. Great post, Kudos to you for placing all this useful information in the one spot. Excellent stuff! Now I'm less of a scrub. +1 to you, Mr. Mexican. I've noticed some people (posters here as well) have a flag under their avatar called "Tagger First Class" what is it and how do you get it? I am most active in the Technical section. need any help? feel free to ask!